He first encountered Capoeira while training for open martial arts tournaments, now known as mixed martial arts. The initial attraction for taking Capoeira on as his main style was the high cardiovascular workout and not sporting black eyes at work every week. However what really kept Christos captivated was the complexity and variety of the game, the rhythm, the mental aspect as well as the physical. After training with Mestre Paulaco in Reading Christos returned to Leicester, where he and his good friend Tim El-Sheikh started training with Lloyd Howell (Carousel) and subsequently set up the first Senzala Midlands class, under the guidance of Mestre Gato. 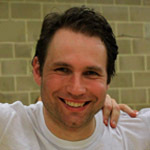 Christos now lives in Grantham, where he leads the local classes.